The plan: to steal a priceless elven manuscript that once belonged to her family, but now is in the hands of the most powerful man in the Republic. To do so Loch—former soldier, former prisoner, current fugitive—must assemble a crack team of magical misfits that includes a cynical illusionist, a shapeshifting unicorn, a repentant death priestess, a talking magical war hammer, and a lad with seemingly no skills to help her break into the floating fortress of Heaven’s Spire and the vault that holds her family’s treasure—all while eluding the unrelenting pursuit of Justicar Pyvic, whose only mission is to see the law upheld. 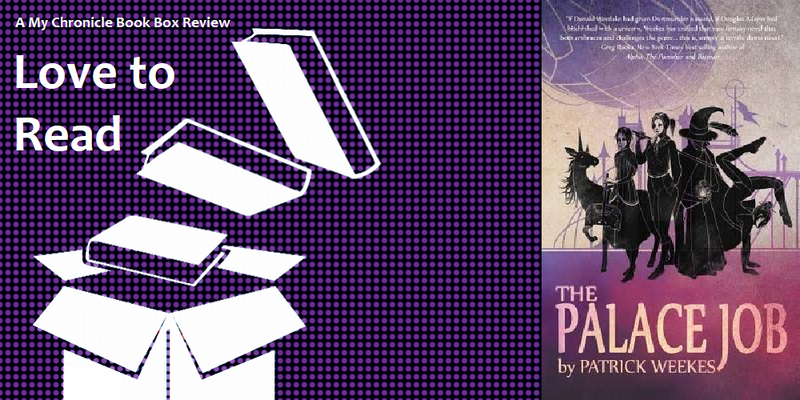 It’s been a while since I really flexed my imaginative muscles in a new fantasy world and I really enjoyed this high magic world created by Patrick Weekes. This book really sparked my imagination from the very first page beginning with Heaven’s Spire the magically flying city inhabited by the Republic’s rulers, to the news being delivered by puppeteers rather than mere newspapers and beyond to shapeshifting unicorns. The book begins with the daring escape of former Republic soldiers Loch and Kail from the high-risk prison that is located beneath Heaven’s Spire. And I do mean beneath, the prisoners are tasked with keeping the magical apparatus that keeps Heaven’s Spire afloat clean and are chained to rails to avoid them plummeting to their deaths. From here Loch sets out to gather a team capable of stealing back an item of importance from Loch’s past which also has great monetary value and is, therefore, attractive to a band of thieves. Typically the item is held on Heaven’s Spire so Loch is set on returning to the city that she has only just escaped from. Things do not go smoothly, though Loch is extremely adaptable and her plan very flexible, but there are complicating factors including Justicar Pyvic the Republic law man, magical creatures, vengeful former colleagues, politics and most alarmingly destiny seems set to interfere. The story’ twists and turns kept me guessing and on the edge of my seat. At some points, I felt my head was spinning and I exclaimed aloud when the plot twisted again! As promised in the publisher synopsis it was indeed action packed and it was also well paced with an imaginative plot line. It was, however, the diverse team and the wonderfully written and pithy dialogue that really made this book for me. What a brilliant group of unique characters! They are all very different and, even though it was a large cast, each felt complete and fully formed in their own right. That can’t have been easy to achieve especially for a debut novelist - hats off to Patrick Weekes. I am moving straight on to book #2 The Prophecy Con with excitement.